I've mentioned House of Wire's Prowl a couple of times in my Free Games of the Week column, and again in the PC Gamer magazine, and that's because I love their small-yet-detailed environments, which ooze atmosphere and immerse you in a strange location for as long as you want. They've just released a game called Trawl, which will set you back a modest $5 on Itch.io. 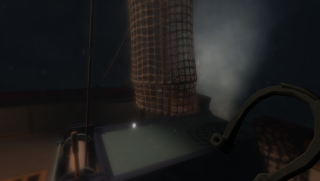 Trawl transports you to a fishing trawler in the middle of an endless, rainy sea. Unlike in Prowl, you can actually move around here, and operate a number of things including the ship's wheel, the speed controls, and the net you'll use to dredge up items from the seabed. The items are seemingly picked at random, but you can decide on a story linking them together if you want, using the typewriter and empty message-bottle in your cabin. (You could also write a joke, or anything really.) Trawl saves these missives to your Documents folder, and I'm told via email that House of Wire's Nathan Gallardo is "in the process of obtaining tiny glass bottles and a thermal printer. So if we can talk our way into any shows/exhibitions we'll be able to print out people's messages and pop it in a little bottle for them to take away". Which is just lovely. Like Prowl before it, Trawl is wonderfully atmospheric, and I'm looking forward to returning to see what other treasures I can dredge up.